With all the little details that come with planning your dream wedding, it’s easy to get carried away. Here are our top 5 money saving tips when planning your wedding! 5. Set a budget & prioritize. Choose your top three categories that are most important to you. Is it catering? Live music? Venue? By deciding which aspects of your wedding are most important you, you’re able to allocate the majority of your budget to those areas and remain frugal on the areas that do not matter as much(do you really need party favors?). 4. Be flexible. For example, Saturdays are prime days for weddings, so they will generally be higher priced. Be flexible by choosing dates in off-season (summer in the southern states) or dates that fall on a week day and you will save a lot of money. One venue I work with has pricing for Fridays and Saturdays at one rate, but they price Sundays at a much lower rate. Ask the venue owners if they have any deals like this one! 3. 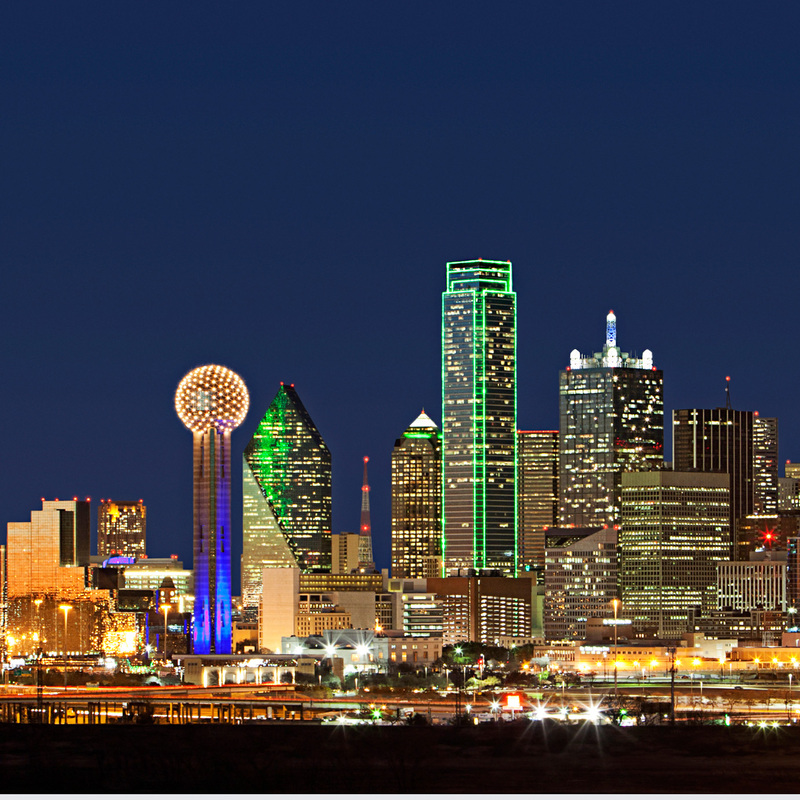 Search for deals in unusual places. A bride and I were researching the costs to make a sign for the ring bearer to carry down the aisle. With time and supplies involved, it was going to come out to be around $50+. After searching on Pinterest, we found a link to an Etsy vendor who was selling the signs for $25, plus shipping. It was less expensive and it saves us the time of needing to go out and buy supplies. 2. Informal is always more affordable. The more formal your wedding, the more costly it’s going to become. Keep it as informal as you’d like and you’ll save in many areas. Larger more intricate weddings will generally have more moving parts and vendors which will add more cost. 1. DIY DIY DIY. If you find that you’re too busy to do anything yourself, utilize your bridesmaids and family! By designing your own invitations, making your own boutonnieres and decorating your own centerpieces, you will find that you save a lot of money and receive personal satisfaction from adding your own touch to your wedding! Ice Cream Sundays: Keep cool with yummy ice cream for your guests! 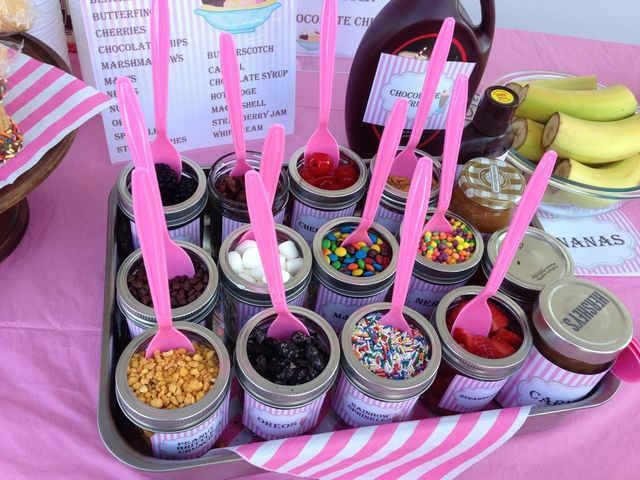 Set up a table complete with ice cream,sprinkles, fruit, chocolate syrup, and whipped cream! But remember to keep the station in a cool place to avoid melting! Refreshing Drinks: Do you plan on having a kid-free party this summer? Try one of these refreshing summer drink recipes here! The Strawberry Pineapple Slush looks delicious! *Most of these recipes can be made non-alcoholic if many of yours friends intend on bringing their children to your party! Safety First: Us Texans know better than anyone how important sunscreen is when spending any amount of time outside. 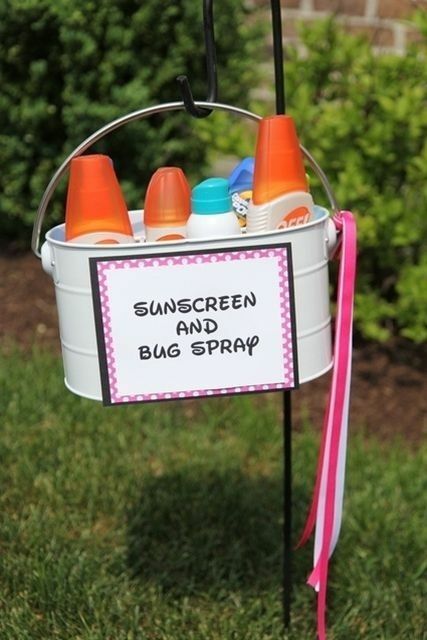 And if you plan on throwing an outdoor party, not every guest will remember to bring that precious sunscreen! Consider providing sunscreen, as well as other necessities like bottles of water and bug spray. *If you are throwing a 4th of July party and intend on bringing fireworks for your guests to use, make sure everyone is knowledgable of firework safety and how to handle them. The last thing you want is an unfortunate accident to ruin the night! 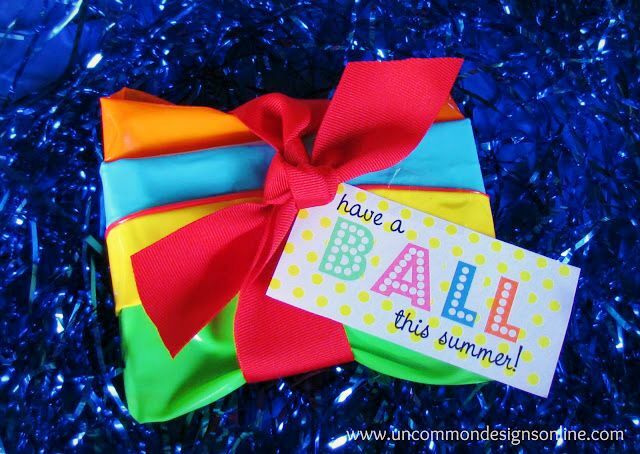 Party Favors: If your budget allows for party favors, consider handing out pool toys or beach balls as a cute and inexpensive gift. Another cute idea is to hand out plain-colored flip flops to your guests and set up a station filled with paint, markers, stencils, and stickers and have them decorate and personalize them! Music that fits your theme. New York society bandleader Alex Donner says his clients are requesting music to go along with their wedding’s theme. These themes can range from films like The Great Gatsby to a specific city or culture, like a Parisian themed wedding where all the songs are French! conversation and will allow to them to see their food more clearly. Consider using color in your lighting to add to your theme and/or lighting candles to create a more natural and romantic feel. Consider your colors: Are you looking for a more romantic evening? Choose to decorate in warm colors, like dark reds and burgundies and warm beiges. If you want to create a lighter and brighter mood filled with laughter and dancing, decorating in bright pastels or summer colors will illuminate the room! Encourage socializing: The quickest way to kill the mood of a party is with silence! You want to find fun and unique ways to engage your guests and get them talking. Not everyone wants to dance, so you may want to come up with new ways to make sure your guests and socializing and having a good time. More and more people are using photo booths at their events, as this is a great way to get guests out of their seats and laughing. At a wedding reception, you can allow guests to write pieces of advice or little jokes on a large canvas for the bride and groom! There are tons of ways to get the guests involved so they aren’t sitting at their tables bored after dinner. *If you plan on hiring a DJ, make sure to ask if he/she have any ideas for fun games to play at your reception! Often times, DJs will have lots of things planned to engage guests and make the event more fun for all involved. 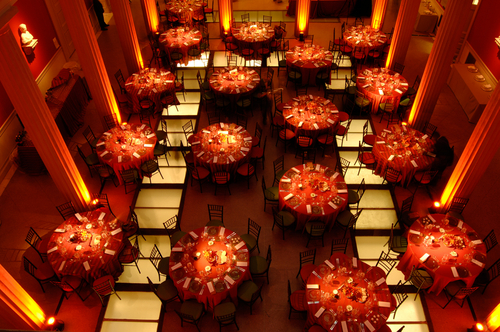 Holding an office or corporate event? According to the Chicago Business Journal Afternoon Edition Newsletter, there are some big trends for office and corporate parties for 2014. 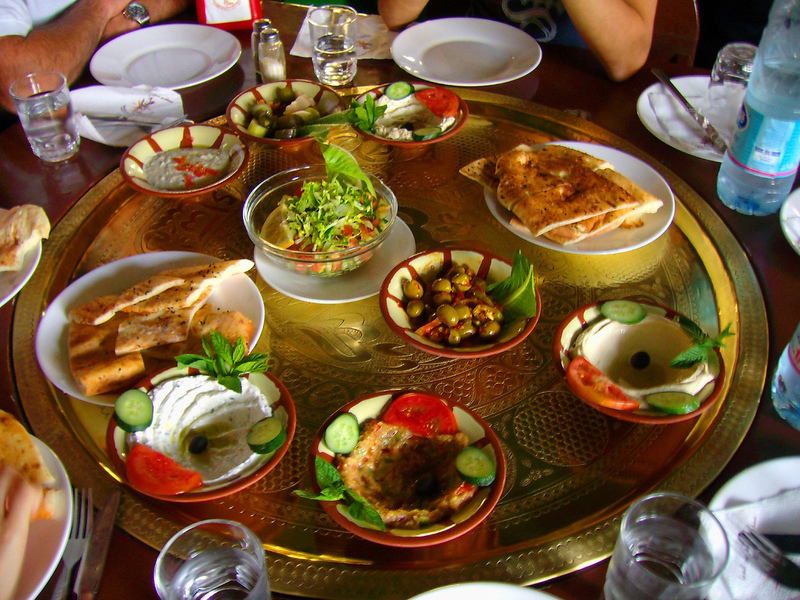 For example, more and more people are incorporating ethnic foods into their catering choices to add culture and flare to the evening and put an end to the monotony of the same old foods we see at every event we attend. I for one really hope this trend takes off and sticks around. As great as it is to have lunch or dinner provided at a corporate meeting, the sub sandwiches and chicken dinners are getting old. Another blooming idea for corporate events is to have “Social media ambassadors” who receive discounts or perks for promoting your event on their social media. Choose an ambassador who has a wide range of influence and is respected in their field. The Healthcare Information and Management Systems Society in Orlando is using this technique in the hopes that their event will reach more than 35,000 people. Read more about this here! Decorating trends are also blossoming and expanding, from unique and rustic locations to more modern and sleek venues. Either way, color blocking and the use of centerpieces to accent the venue are high in popularity. Round tables allow for discussion and networking at larger events, just make sure your centerpiece doesn’t block out people across the table.